Though Shane Warne has a pressing assignment on hand to see through his team Rajasthan Royals past Delhi Daredevils to keep up their winning momentum in the Indian Premier League at the Ferozeshah Kotla ground here tomorrow night, the Australian spin wizard also took time out, on the eve of the match, to attend a function, and speak his mind out on various issues. Their semifinal hopes fading after four consecutive losses, Chennai Super Kings face another uphill task when they take on the in-form Royal Challengers Bangalore in the Indian Premier League here tomorrow. Former Pakistan captain Mohammad Yousuf, who announced his retirement from international cricket on Monday, has kept the doors open for a comeback, saying he is only ‘retiring for the time being.’ “I’m retired for the time being,” Yousuf said while reading a written statement at a packed Karachi Press Club, but he refused to speak about the reasons behind his decision. Legendary cricketer Kapil Dev, who is a honorary Lt. Colonel with the Indian Territorial Army, today visited the Sainik School in Nagrota, during his three-day visit in Jammu and Kashmir. Kapil, who is a pupil of D P Azad, the first cricket Dronacharya awardee of the country, did not subscribe to the views of his mentor on T20 cricket. Kapil spoke extensively about cricket and replied to a number of questions about the sport’s future as well. He was candid about the need to have a shorter IPL, creating a window for it, Sachin Tendulkar’s greatmess and joining issue with M S Gill on his views on IPL. He said Tendulkar was the “best batsman” he has ever bowled to, but he was “not scared” of the batting legend, though he had said something to that effect “jocularly” after the Sharjah One-Day International series. “I want to clarify that this nightmnare thing was a joke. Sachin is the best batsman of my time and I always enjoy the challenge of bowling to him, but I am not scared of him or anybody for that matter”, said Warne at the launch of an hair product. He said he would not have taken so many wickets had he been scared of any batsman. He had taken 708 wickets in Tests and 293 scalps in ODIs and said he had “quite a few hair-raising experiences” bowling at Sachin, as he had hit him all over. “But I also got him out quite a few times”. The Rajasthan Royals captain also gave his thumps to IPL, saying the league was not about money alone, as many a young players had discovered their true potential by playing in the league. He rubbished the views of Minister for Youth Affairs and Sports M S Gill that the Board of Control for Cricket in India (BCCI) was changing the rules to favour IPL, which was a purely commercial venture, with many big guns of the BCCI having stakes in the teams. He said players like Suresh Raina and Rohit Sharma (both Chennai Super Kings) and Ravinder Jadeja (Rajasthan Royals) had benefited hugely by playing in the IPL. “Ravinder Jadeja bats at No 9 for India in Tests and can play at No 4 in T20 World Cup. These players are evolving into match winners after the IPL stints”, Warne noted. Regarding the slotting of the future editions of the IPL, Warne said the IPL should work it out with the International Cricket Council to create a window for the event “so that it becomes mandatory for all the international players to tour India during the IPL.” “It will give the Indian players opportunities to rub shoulders with all the great stars and learn”. That said, Warne will be focussing on taming Delhi Daredevils at the Ferozeshah Kotla to keep up their amazing come-from-behind winning streak. In the inaugural edition, Rajasthan Royals had lost to Daredevils in the opening match, before making a remarkable recovery that eventually took them to the throne. Royals are on such a roll now, after suffering some early defeats which many felt would put them out of business for the title race. But the astute captaincy of Warne has turned around the fortune of Royals, and they are all set to take on the might of Daredevils on their home ground. Daredevils themselves have found their winning ways after suffering two defeats at home and one away. They have now won four of their seven matches like Royals, to be in line for a place in the semifinal. With regular skipper Gautam Gambhir back in the squad after sitting out three matches due to a hamstring injury, Delhi’s confidence is on a high. David Warner's brilliant century against Kolkata Knight Riders has added depth to the Daredevils’ batting as they showed that without big scores from Sehwag and Gambhir, they could still emerge victorious, with the help of their foreign recruits who are no mere journeymen, but players with substance. Daredevils’ gameplan jelled into a fine whole against KKR as the bowlers and fielders built on the platform provided by Warner and Collingwood’s knocks to subdue KKR. But Royals under Warne would be a different proposition as they have some explosive stroke-makers like Yousuf Pathan, Lumb, wicket-keeper Naman Ojha etc and deadly bowlers like Warne himself. A full house was witness to Daredevils victory last night, and another sell out crowd would be there for a cracker of a contest against Royals. Their semifinal hopes fading after four consecutive losses, Chennai Super Kings face another uphill task when they take on the in-form Royal Challengers Bangalore in the Indian Premier League here tomorrow. Lying second from bottom, Mahendra Singh Dhoni’s Chennai need to turn it around from here or miss the semifinal bus. Anil Kumble’s Bangalore are comfortably placed second in the points table and would be further bolstered by the joining of the hard-hitting Englishman Kevin Pietersen. After the Bangladesh tour, Pietersen went back to England to visit his family for a while before joining Bangalore yesterday. There seems no worry for Kumble in the bowling department as his pacemen have done their job well enough so far and the dice is likely to roll in their favour. The last 10 days have been a nightmarish experience for Dhoni, who could not play in three of the team’s last four matches. They were dumped to the bottom after downhill slide that started with the Super Over loss to Kings XI at home. Dhoni himself reasoned that if batsmen fail, it affects all the other departments. “We made several changes in the team, but nothing is working for us. We are ending up doing more and more changes. We need to settle with one squad. From now onwards, every game is important,” he said. Despite having an in-form Matthew Hayden, Chennai have struggled as a batting unit and bowling was never their strength anyway. Given their flip-flop form, it would be interesting to see to how Chennai’s batsmen negotiate the class of Kumble and a nippy Vinay Kumar, who is high on confidence after getting a call-up to the national team for the Twenty20 World Cup. Despite a volley of questions from the media gathered at the press club, Yousuf chose to keep mum and repeated the written statement. Yousuf, however, appeared disappointed at the treatment meted out to him by the Pakistan Cricket Board (PCB), which has imposed an indefinite ban on him in the aftermath of the disastrous tour of Australia. “In a letter sent to me by the PCB I was told that my presence in the national team is harmful for Pakistan cricket.I don’t want to cause any more harm to Pakistan because it’s very dear to me. That is why I’ve decided to retire from cricket. I’ve thought a lot before taking this decision and also received a lot of advise from my elders,” Yousuf said. 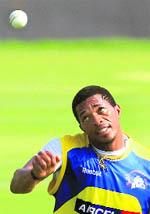 He also hinted that he would continue playing first-class cricket and in private leagues. “If I get time, I would love to play first-class cricket and in leagues. I have to stay fit,” The News quoted Yousuf, as saying. Originally a Roman Catholic, Yousuf converted to Islam in 2005 and has since been involved in preaching besides playing cricket. Q: Do you think T20 cricket has affected ODIs or Tests? A: T20 is a newly-born baby and if you will start raising fingers or levelling allegations at this time, then it will be a big mistake. See, whenever any new thing comes, it has its own advantages and disadvantages too. We should see or count the advantages only. If there are some disadvantages, then it should be avoided. I can’t speak more on this as even I am slowly coming to terms with the newest format of the game. Q: What is your view on Union Sports Minister M S Gill’s statement whereby he had alleged that some senior BCCI Officials were being benefited by the IPL? A: Everyone is free to think, whatever comes to mind. This is the favourite sport of the people. Whenever any new sport comes, there are some lacunas and that are to be corrected. About any business or something else in the IPL, it is thinking of the Sports Minister and he has given statements as per his own thinking. This is a loveable sport and I have also played it for a long period. So let it be a sport, not war of words. Q: What do you think about the changing lifestyles of players, for example someone like Yuvraj Singh? A: I don’t know what lifestyle he has adopted as I don’t stay with him. He has to look after himself and if he will not perform well, then it will be a major loss to the team also, because he plays well and he has the talent. He (Yuvraj) knows his lifestyle and we know his game. Q: Dressed in combat uniform, how do you feel as an Army officer? A: I feel proud, whenever I wear this uniform. I want to say one thing here that fighting with the militancy is everybody’s equal responsibility and we must share it and jointly curb it.